I bet you thought that I had given up on this! I haven't, but all the hullabaloo about server transfers was too distracing for me to write about anything else really. However, now that things are slowly getting back to normal, let's talk environments. One criticism of the game that I've seen a few times is that it supposedly doesn't have good graphics. Personally I don't see that at all, but then I also feel that I haven't actually encountered a game with genuinely bad graphics in many years. That's not to say that I like all modern video game graphics to an equal extent, but my like or dislike isn't so much based on their supposed quality as it is about overall style and maybe nitpicking on details such as that I don't like the look of certain animations in some games (also refer to this Extra Credits episode). The Old Republic has won me over in every respect here, as I love the slightly cartoony style (I really don't care for attempts at photorealism in games), I adore most of the animations (seriously, I could just watch Jedi knights jump around all day and I'd be happy), and overall the art direction very much follows the aesthetics of the films by focusing on interesting character designs placed in front of gorgeous backdrops. My favourite operation from a visual point of view is still Eternity Vault. Nothing says "Star Wars" like huge, gaping chasms without safety rails! Also, the place just generally feels enormous, even though the area you actually play in is of limited size. 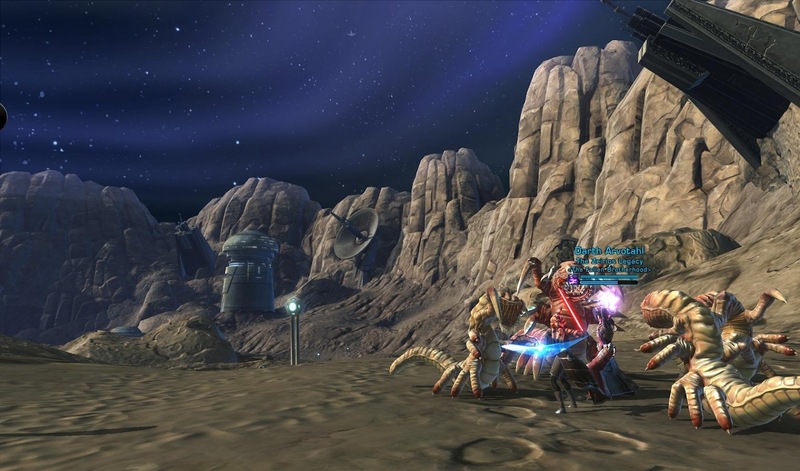 For a bit of contrast, within the same operation we have this scene, taken during a raid break. 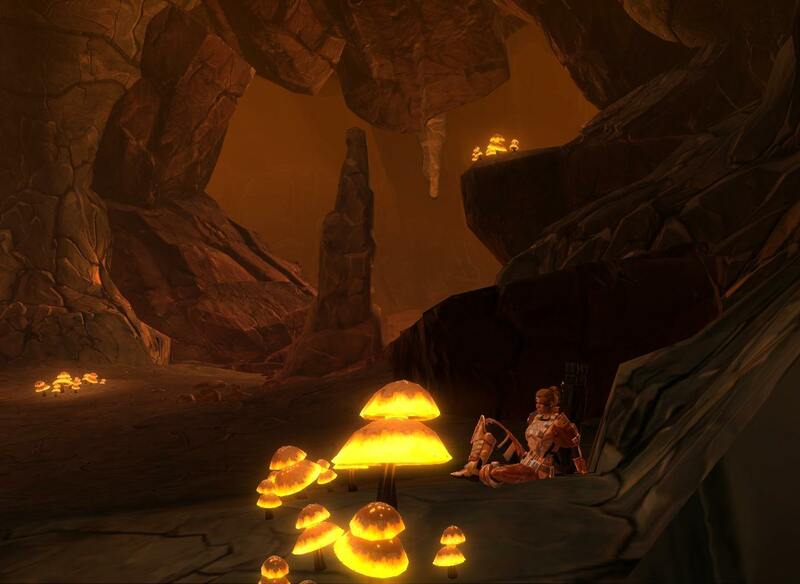 Here the little details actually work quite well - I loved the look of those glowy mushrooms. Too bad I rarely get to pay attention to them while we plough through trash mobs. One thing I still don't do nearly often enough is look up. I thought that Quesh had pretty much no redeeming features until I went there with my agent and my companion Vector prompted me to look up with a comment about the redness of the sky. Dude! I can't believe I never noticed! 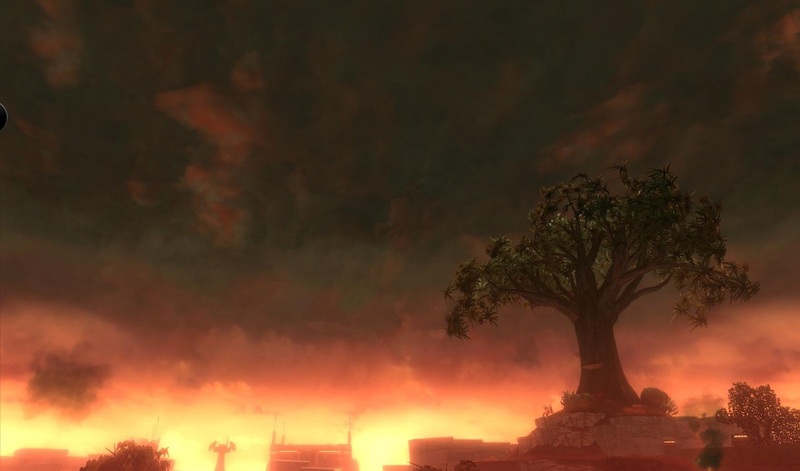 I now try to pay more attention to my companions' prompts, as they encourage me to stop for a little while to appreciate the scenery (even if I'm itching to get to the next part of my class quest). 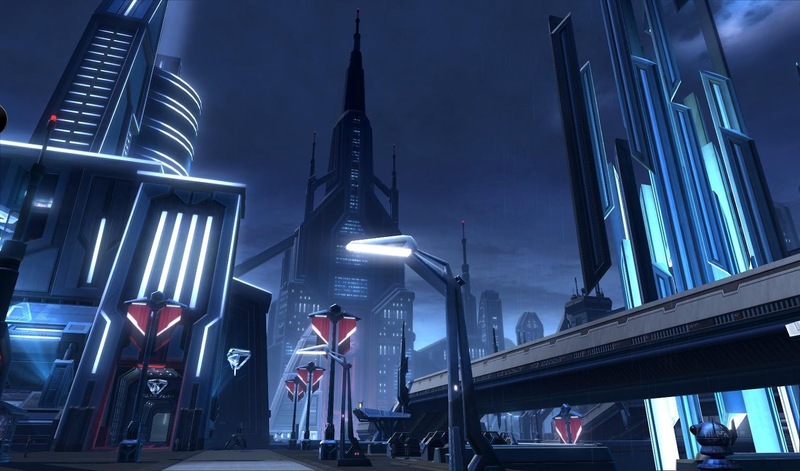 Mako has been very good at this on Dromund Kaas in particular. Until she made me look up while playing my bounty hunter, I never even really noticed the way the citadel in Kaas City looms above the rest of the city. 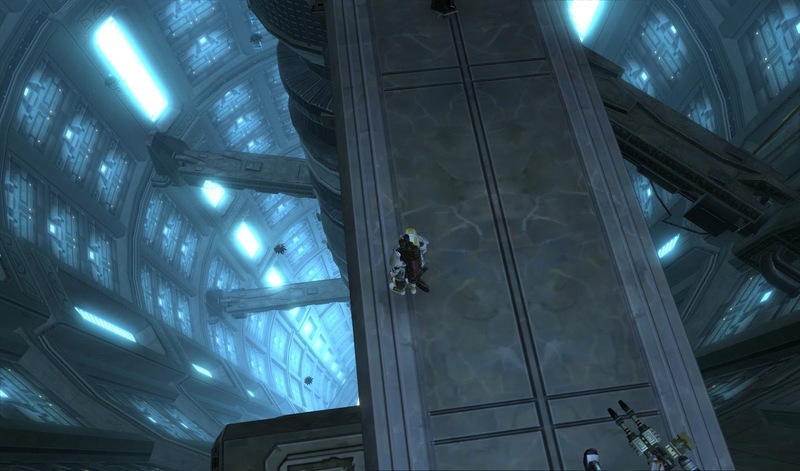 And for a nice view of space, here's my boyfriend's Sith inquisitor boosting me through the Foundry. (We did eventually make it past HK-47 once he hit max level.) When we stepped out of the actual installation and found ourselves with naught but a force field above our heads, I was quite awed. Very atmospheric. Oohhh. Nice screenshots! I agree, photorealistic graphics aren't really a sign of a game's overall quality. Very often I prefer a much more stylised or "cartooney" look, because it is much more atmospheric. Photorealism sometimes is a bit soulless. What's up to every , for the reason that I am truly keen of reading this webpage's post to be updated daily.